The Digital Transformation of the Power Industry Is Happening Now. Are You Ready? Terms like Industrial Internet, Industrie 4.0, the Fourth Industrial Revolution, Digital Plant, and others are proliferating, and their advocates promise exponential benefits from digitally connected technologies. But power plants are unlike all other plants. That makes understanding the new digital technologies and capabilities especially important—whether you own generation or provide equipment and services to the industry. Whatever buzzword you use, now is the time to develop your strategic digitization plan—or risk getting caught in a digital buzzsaw. That’s why POWER is launching its Connected Plant Conference. 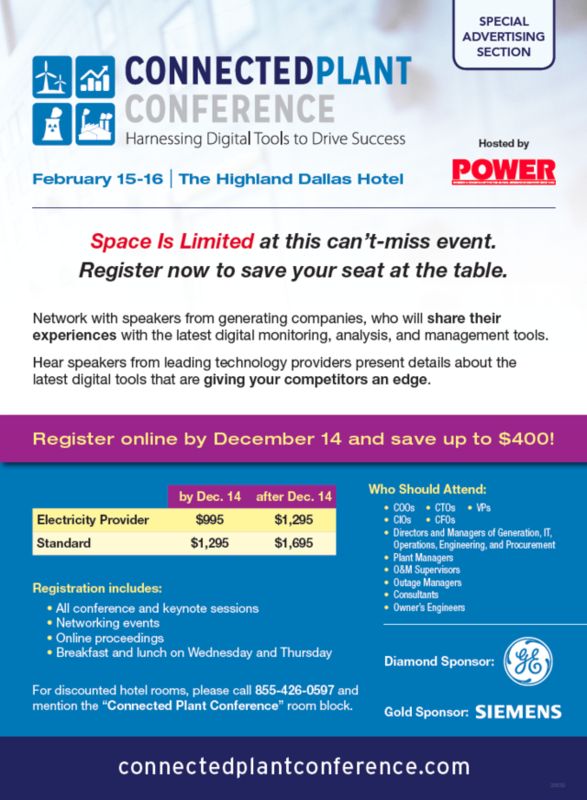 POWER’s Connected Plant Conference will be held February 15 and 16 in Dallas. 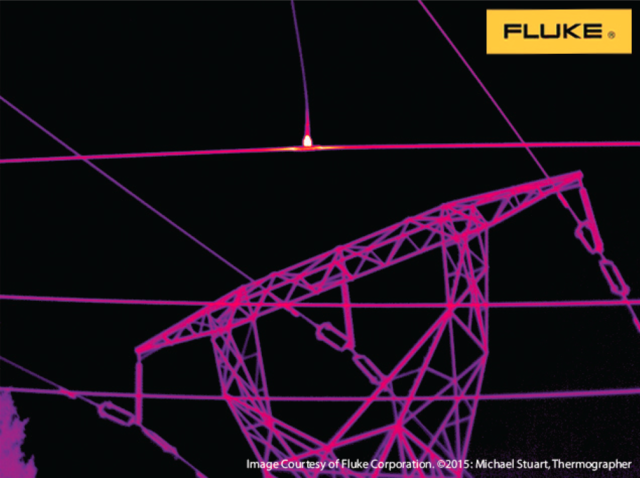 Unlike other events addressing advanced digital tools and the Internet of Things, our Connected Plant Conference is the only event focused exclusively on the power generation sector. Sessions will address how to use connected plant technologies for efficiency, reliability, profitability, safety, compliance, and security. 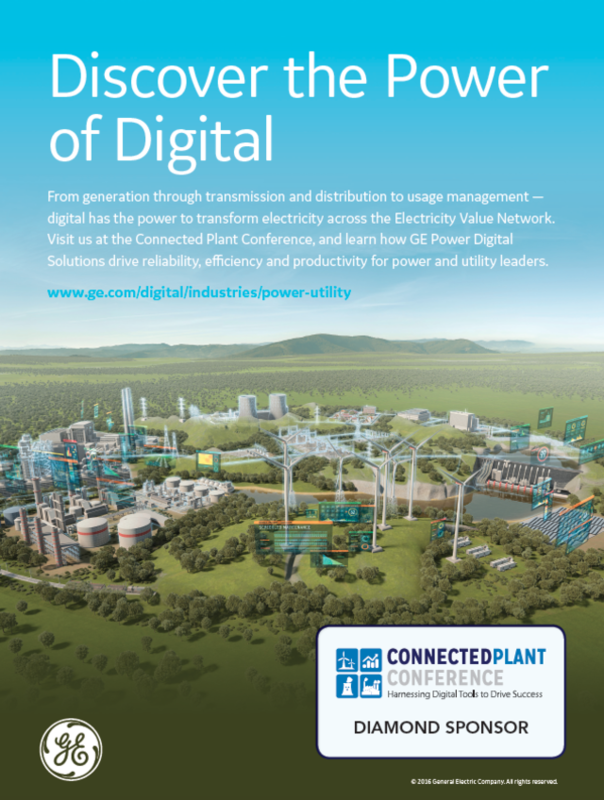 Whether you represent a large, multi-facility generator or a smaller municipal or cooperative utility, the Connected Plant Conference is designed to give you the information you need plus access to technology providers and generating companies on the leading edge of the digital transformation. Industry leaders are sometimes hesitant to adopt advanced digital technologies because they’re concerned about cybersecurity. Nevertheless, standing on the sidelines is quickly becoming an untenable option. As new facilities are built and existing ones are upgraded or maintained, ensuring best-in-class performance increasingly requires greater data collection, aggregation, and analysis. As the power of connected plant technologies increases, decision-makers, managers, and operators across all company functions will need to become informed about the new capabilities and how to harness them. Managing cybersecurity risks is an integral part of pre-purchase due diligence, training, and daily operation. The only way to ensure that you are asking the right questions is to become more informed. Through presentations, lunch discussions, and hands-on exhibits, the Connected Plant Conference facilitates information sharing with technology developers, generators that have deployed new tools, and independent industry experts. The tagline for POWER’s Connected Plant Conference is “Harnessing Digital Tools to Drive Success.” We’re not suggesting that any of the amazing new technologies available from vendors large and small can be bought, deployed, and ignored. Yes, many of them are designed to simplify processes and provide better information faster. But no technology solution can be left to run on its own. Informed human drivers need to determine how those tools will be harnessed to drive operational and business success. Deriving successful outcomes from connected plant and Industrial Internet of Things technologies also requires a certain amount of cultural change. That’s why we have a session dedicated to the collaboration required between operational technology (OT) and information technology (IT) experts. In some organizations, there’s a wide chasm between IT and OT, but the days of turf protection are numbered. To avoid poor decision-making, poor implementation, and potential disaster, these two technology groups, management, and operations leaders must come to the same table to learn about each other’s requirements and concerns. 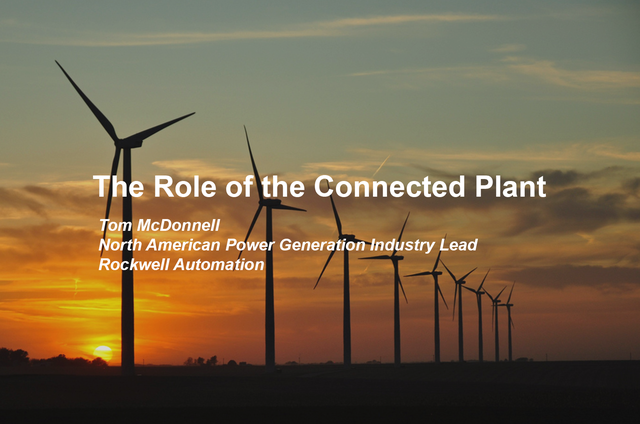 To encourage dialog among the various organizations that need to understand the implications of digitally connected technologies, POWER’s Connected Plant Conference is designed not just for those who work in power plants, and not just for those in corporate offices. It’s an opportunity for all interested parties to network face to face in a neutral learning environment. Over the last 20 years, thermal imagers have been transformed from heavy, fragile, extremely expensive and complicated instruments, to compact, rugged, portable, affordable and easy-to-use tools. That transformation has a lot to do with why infrared cameras are being found in more walks of life every day. 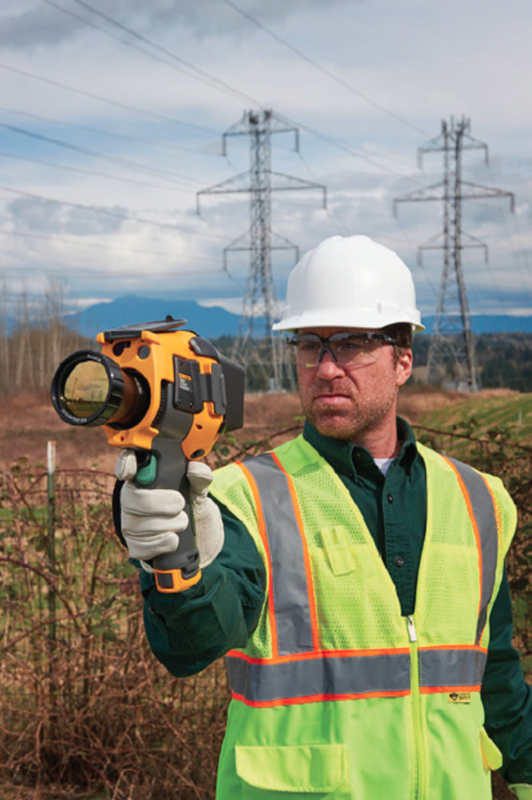 Today’s thermal imagers offer a much wider range of sensitivities, resolutions, and lenses, making them especially useful to utility workers who have to inspect all kinds of high voltage transmission system assets. Regular inspections of all aspects of the power network are critical to addressing potential problems before they become actual problems. These inspections are also required to enable utilities to meet increasingly rigorous safety standards. 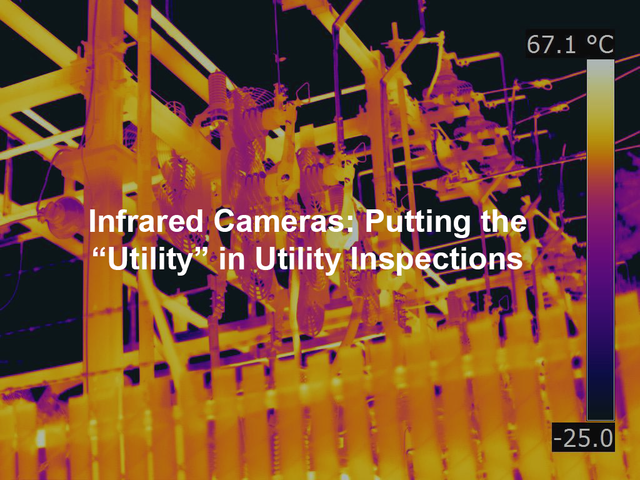 The affordability, portability and functionality of infrared cameras make them a very practical choice for all kinds of utility inspections. Utility companies must regularly inspect transmission assets to find hot spots before they cause unplanned and often expensive outages. High resolution infrared cameras allow better inspections from the ground and from a helicopter. They also provide easy ways to identify the physical location of a temperature anomaly. On some camera models, technicians can add text or voice annotations to the image as they record it. They can also capture a visible light image simultaneously with the infrared image to make it easier to see visual location details. Technicians can use an infrared camera to scan the outside of a substation from up to 100 feet away. In power plant switchyards, infrared cameras come in handy for checking the oil level, flow restrictions and leaks in oil filled breakers and transformers. They also can identify hot spots in circulating pumps, generators, insulator bushings, and connectors and control cabinet components. An equipment failure in a transformer vault can be costly and dangerous. However, climbing down into a cramped underground vault isn’t any picnic. Using an infrared camera can make it a lot easier. A technician can lower an infrared camera equipped with a wide angle lens into the vault to quickly scan a large part of the interior from above. The technician can then wirelessly connect to some infrared cameras to view the results above ground on a mobile device or PC. If there are additional areas that can’t be seen, the technician can don PPE and climb down the ladder and complete the inspection. This allows inspectors to identify obvious hazards from a safer distance, before moving into a hazardous area. As utility companies continue to be challenged to do more with less, infrared cameras play a major role in increasing productivity and safety, so workers can get the job done efficiently and go home at the end of the day satisfied. 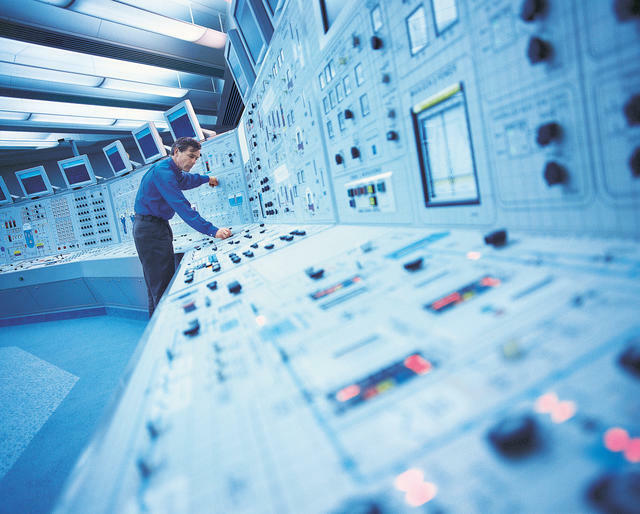 The role of a Distributed Control System (DCS) in a power plant has traditionally served to provide a “connected atmosphere” between the operator and the entire power plant. Its function centralized plant operations to allow control, monitoring, and reporting of the individual process areas. A modern DCS goes further to offer a deep understanding of real-time events to empower rapid decision-making by bringing process areas and human capital together as never before. By connecting the physical and virtual worlds, the Industrial Internet of Things has become the basis of the enabling technology for a connected plant. More and more business operations are becoming visible, enabling users to understand constraints and opportunities closer to real time. 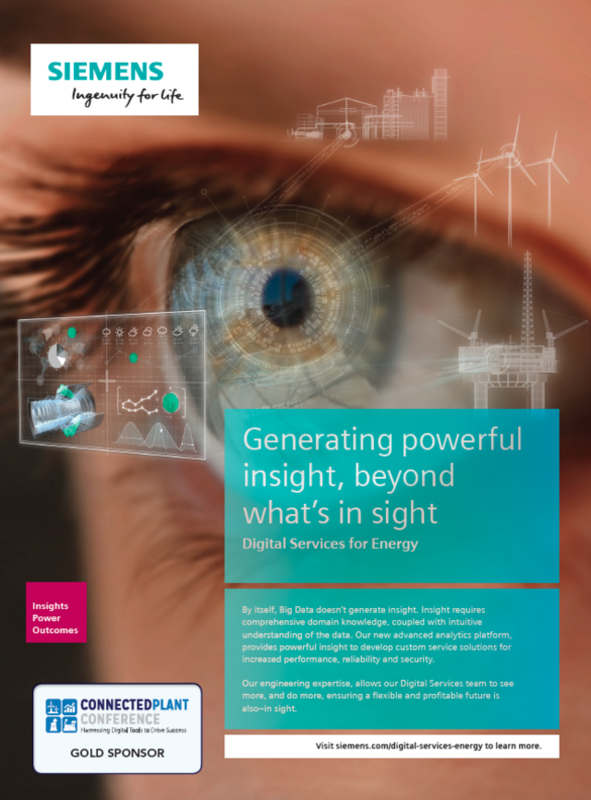 Applications and systems, such as integrated intelligent electrical devices and smart instrumentation, can be unified – resulting in speedy data analysis for richer insight and better decision-making. To accomplish this, data is collected and synchronized facility-wide with high-accuracy time stamping and aggregated through a secure Ethernet/IP network and the IEC61850 standard. This integrated digital structure requires less control system inter-wiring, less engineering detail on drawings, less hardware, less fabrication wiring, and fewer points to test. This helps reduce costs across the entire lifecycle of the plant control system. Within a power plant, Rockwell Automation takes “big data” and operationalizes it to facilitate better decision-making at all levels of an organization. Fleets comprised of fossil and renewable generation assets can be connected at an enterprise level to collect and analyze data globally. Data can be standardized and presented in context to the operators and analysts across a unified HMI. This permits operators to make real-time comparisons of thermal plant heat rates for dispatching. Operations can also drill down into specific plant equipment health to help optimize assets. For renewable generating assets that are typically unmanned, data can be collected at an enterprise level. The sites can be combined into one unified, scalable platform, creating a reporting solution that provides flexibility and versatility to help reduce the time to onboard and make new fleet acquisitions operational. With the Connected Plant, IT and OT staff and systems are no longer completely isolated. This creates a new era of systems’ convergence and collaboration – turning big data into smart and intelligent data.